BBC visits Bad Axe Throwing over in Washington D.C.
You’ve gotta love a good British accent. 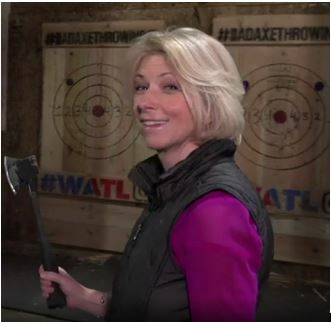 Jane O’Brien from the BBC certainly makes good use of hers when the BBC visits Bad Axe Throwing in Washington D.C! Jane tries her hand at axe throwing while learning more about why the popular sport of axe throwing is all the rage right now Canada and the US. Once you’ve gotten your basic throws down, try one of our more advanced trick shots to dazzle your friends (and grab a few likes on the ‘Gram). It’s good to see our brethren across the pond coming over to compete with us. It’s only fitting that the World Axe Throwing League accommodate all nations across the globe as they vie for the top cash prize every season. BBC correspondent Jane O’Brien certainly had a glimmer of hope in her eye as she stuck a bullseye at the end of the video! Whether you are in Washington or one of our other 18 locations, be sure to make a group booking to get the full axe-throwing experience! A booking includes your own lane, professionally trained axe throwing coach, and 2 ½ hours of throwing time for you and your friends (minimum of six people required for a booking). Also, feel free to arrive a bit earlier to set up food and beverage if you desire for our locations that allow it. With the summer months upon us, take advantage of these long days and wrangle up a crew for some friendly competition. Remember to wear closed-toe shoes for your trip; nothing’s worse than a stubbed or cut toe that could take you off the team that needs you! Bookings can be made on our website (no genuine British accent required) so call and reserve today!